You’re gonna LOVE this Oreo Icebox Cake! There are a few foods that my husband loves that I refuse to make. He has an odd fascination with this. And I won’t make it. First of all, I don’t do pate´. Second of all, beef tenderloin is like 4 million dollars, and since I do the majority of the food shopping, I try and not blow my weekly budget on one giant slab of meat. Call me crazy. Also, it seems complicated..and as far as I know it can’t be done in a crock pot…sooooo….I’m out. And when I say “Icebox Cake” I mean the kind his mom made him when he was little…layers of chocolate pudding and graham crackers topped with whipped cream. Here’s a version I found online. Anyhow, I won’t make it. Because I despise making pudding. Like really hate it. I wrote how I felt about the dessert when I made this Nutter Butter Icebox Cake. I know it’s irrational, but I do. Allllll the stirrring. But despite my better judgement I decided to be a good wife and make him some icebox cake. I skipped the whole pudding nonsense, and went instead for Cool Whip. He needs to branch out. I know some of you out there don’t do Cool Whip, and that’s fine…I suppose you could make this with regular whipped cream. But really, the whole point of this dessert is that you can literally make it in 10 minutes. Oh, and there are Double Stuf Oreos in there. Anyway, Oreo Icebox Cake. Be a hero. Like I said, this is the easiest dessert ever. Then lay them flat in a 9×13 pan. 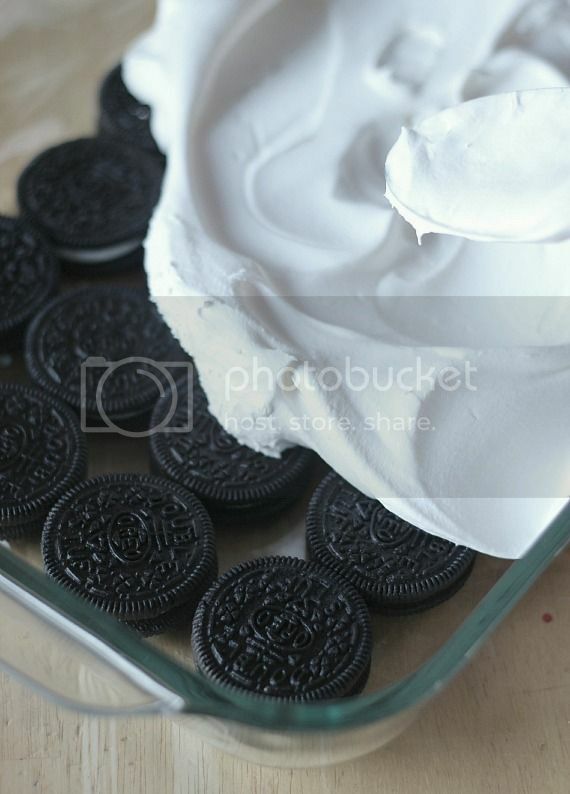 Once you have your first layer of cookies in the pan, top that with a layer of Cool Whip. A whole tub, actually. Repeat this process 2 more times, so you will have 3 layers of Oreos and 3 layers of Cool Whip. Then the hard part. Let it chill. For 6 hours actually. Then serve and make your husband happy. Again, chocolate sauce is optional. Snort. So decadent, so yummy…..I so want this now!!!!! If you are an Oreo fiend like me, then you need to have this in your life. You must really love him! Was there any doubt you were a hero? Looks amazing! What chocolate sauce would you recommend? Honestly I just used Hershey’s syrup here, but any chocolate sauce that will give you a nice drizzle will be great! How’d you get that sweet design on top? It’s so pretty! mmmmmmm that looks so yummy!! Here is the one that I made for special occaissions (sp) and now my daughter in laws favorite birthday cake. 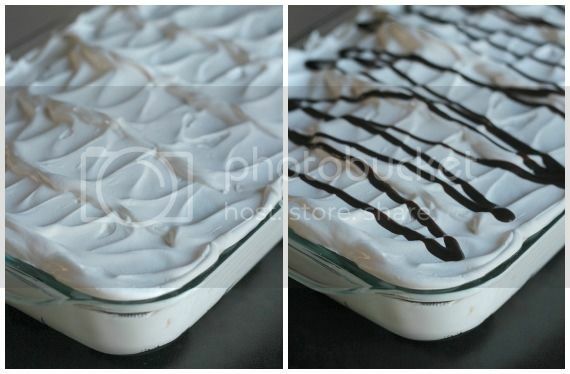 http://acozykitchen.com/classic-icebox-cake/ I make it in a log style instead. I will have to try this with cool whip and make my life lots easier, thanks for that tip! 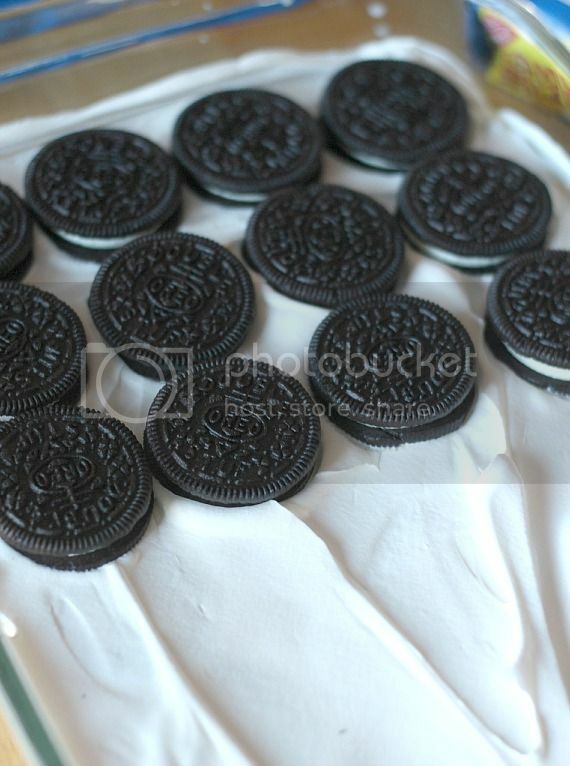 I love any combination of Oreo especially in my deserts and this is so perfect and easy to make! Thanks for the recipe! It’s fake whipped cream- made with oil. there aren’t words for how much my dad will love this cake. ….if there’s enough left for him after I’m done burying my face in it. This looks insaaaaaane. Who needs Beef Wellington, anyways. Looks SO yummy!! I want to try this with the Golden Oreo’s too!! This looks crazy insane! 😀 SO many oreos, I`m in love! My gosh this looks awesome! And crazy easy! Love it! So, what was HIS opinion of this? This soooo sounds like something my hubby would say. I mean really, you TRY to do something nice and boom, they go and erase all the nice-ness away!!!!! And btw, for those who “don’t do Cool Whip” (me either) , Trader Joes has an identical product called House Whip. Also , Jo Jo’s are their version of Oreos without the trans fats. Great alternative! Thanks for adding that. I will have to look for the House Whip at Trader Joe’s next time I’m there! This is totally genius! So creative and looks delicious! I’ve always known ice box cake to be cookies and whipped cream, didn’t realize there were versions with pudding. Becca – you are correct. Back in the day, they’d use Nabisco Chocolate Wafers and layer them with sweetened whipped cream. YUM. My husband’s going to love this. Ha! I love how you think–cool whip all the way, girl. No compromises on this score! What says your husband? 🙂 love it!!! I feel like giving you the begging eyes and asking for a bit more please. mmmm! Love this idea. I just made it with a St Patrick’s Day twist- Cool Mint double stuff Oreos! Can’f wait to taste tonight! Ah, such an easy & delicious recipe. 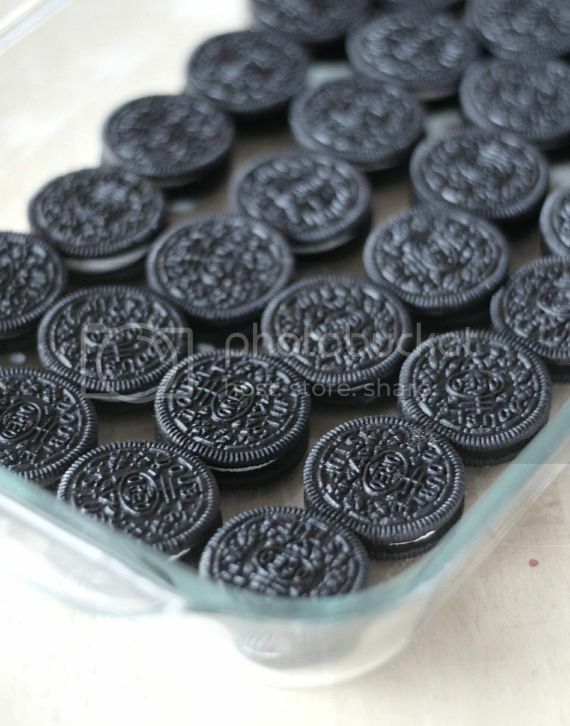 I love the milk dip the oreos take before lining them in the pan. I can’t wait to try this! I love Oreos and Cool Whip!!! I just made this as I have a 14 yo male Oreo monster in my house. He’s going to love this and it didn’t even take me 5 min to put together. I made a smaller version using about 18 cookies altogether. I need to swim in this! I love icebox cakes! This one would definitely be gobbled right up in my house!!! You are the hero of the day! Chocolate sauce is never optional! Wow. Wow. Wow! That looks AMAZING!! Like a dream. I feel like I am dreaming just reading this post! This is pure genius! OMG so good! You are a good wife! There are certain things I won’t make for my husband either…pudding is one. But that has less to do with the stirring and more to do with the fact that it makes me gag. This cake on the other hand…yep, save me a slice. This is an awesome recipe perfect for warmer days! YUM! My little brother, a horribly picky eater, requests beef wellington everyday. It’s not exactly the quickest thing to whip up so I understand your pain. You just gave me the recipe for my son’s new most favorite cake ever!! Thank you thank you! Oh my!!! I can see tell right away that Little Buddy would love this cake!!! (Me too…!) Yum!!! Holy lord! Well, you’ve won me over with this baby. Well I suppose I can make this sacrifice for my boyfriend who is a serious Oreo fiend. And if I taste test a little along the way…who will really blame me? Looks absolutely delicious! My boys would be fighting for every spoonful! Where has this cake been all my life??? I love this take on an icebox cake! Oreo’s are my weakness. I’m just a smitten… LOVE. Just an FYI if you reallllllllllllllllllly want to make another “real” icebox cake with the pudding…you can buy larger tubs of premade pudding in the aisle near the yogurts at some supermarkets/walmart…Kozy Shack is the brand. They don’t have a lot of flavors, but it’s real pudding, not so much chemicals. Anyway, this oreo creation looks delish! Kinda like the ice cream sandwich cake…layers of those with cool whip and you also put the chocolate syrup in the layers (or any syrup flavor you like). Definitely a good summertime dessert! Oh my gosh this looks incredible! I am such a huge sucker for oreos. I’m pretty sure if I made this, I’d never eat anything else ever again. I actually have no problem with pudding. But I’m really feeling the shortcut. And the freaking fantastic excuse to eat 2 packages of Double Stuff Oreos. To make pudding faster instead of doing all that stirring bring your milk to a boil over medium heat add th pudding mix off the heat stir and done. ooo It reminds me of Chocolate eclair!! (oo but that has pudding.. oops) haha. My husband would LOVE this! I’m making it soon! This looks amazing!! I don’t care if it’s fake – I LOVE cool whip. And why even bother with oreos if they aren’t double stuffed? The filling is the best. YUM! This is gorgeous. I would eat the whole pan all by myself. I have to admit I am like your hubby, love icebox cakes. Something so nostalgic about them. Woah that last picture with the drizzle…. Girlfriend….. I’m soooo with you on the “pudding thing” (as well as a lot of what you refuse to do…). Cool Whip is the answer to sooo many cooking “I-don’t-want-to-make” problems!! Like, I refuse to make whipped cream at ALL COSTS!! You are my idol!! I am totally with you on the pudding making. I don’t like to talk about it. This looks absolutely delicious! how about substituting the cool whip with mascarpone , like how you make tiramisu ? You might could try that.. would be interesting! Could you give me the recipe for the pudding? I kind of want to try it making pudding 🙂 I see you have a recipe for pudding with your nutter butter ice box cake but do I do chocolate pudding or a different flavor for this one? Thanks! I made this tonight for a birthday party (well a slight variation because I love pudding) and I totally forgot to dunk the Oreos in milk. Oops- I hope it’s still as yummy looking. I mean, it’s Oreos, pudding and milk so it’ll be good… But still! Its good recipe .What do you mean by refrigerate. We have to keep it in frezeer. Just soak the cookies in milk a little bit longer to make sure they are soft! I was wondering if you could throw this in the freezer for a few hours to keep everything from warming up too quickly? I’d love to make this, but it will have to survive a 45 minute car ride. It looks delicious! I honestly can’t wait to make it! I think it would be fine, as long as it stayed cold. Unless you’re making it from scratch (which I’d assume isn’t the issue since we’re using Oreos and Cool Whip up in here), you can make boxed pudding with a blender. That’s what I’ve always done… pour in milk, dump in mix, blend. I was a little confused about the refusing to make pudding because of stirring! Anyway, this looks AMAZING and I will be making it asap, except I’m going to put some chocolate pudding in there! NOM. Just made this with the “Birthday Cake” Oreos…. Um, AMAZING! I’m thinking this should be the “cake” at my son’s next birthday party! Thanks for sharing! Thanks, I love something quick, easy, yet makes me look like I spent hours creating it! keep em’ coming! This looked so yummy, I had to try it. When I was at the grocery store buying supplies, they had PEANUTBUTTER oreos! So of course I got a box of double stuff and a box of PB and alternated them. On top, I smushed up sme cookies and a couple reeses WITH the chocolate sauce. hehe, now I;m waiting…. Thanks again for the idea! So fun! Can’t wait to hear how they turned out! That is one fabulous looking Ice Box Cake!!! Pretty sure this deserves some kind of wife of the year award. YUM! These are probably dumb questions, but I’ve never heard of ice box cakes and want to make this one for a 4th of July party. Just to clarify, I’m supposed to keep it in the fridge, NOT the freezer, right? And once it’s done, will the Oreos be soft? Or will they be crispy and break up in the Cool Whip? Is this something that will be easy to cut into slices and serve? 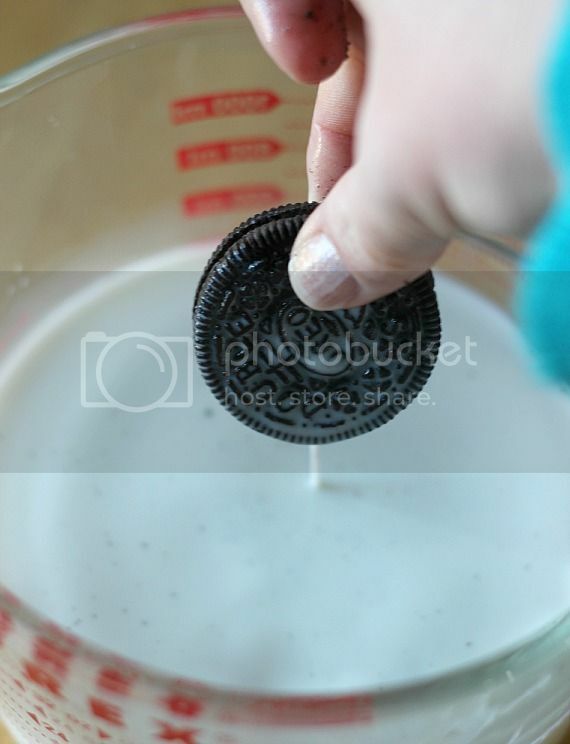 The longer you soak the Oreos in the milk, the softer they will be.. so if you would prefer them crispy, just a quick dunk. A longer dunk for a softer cookie! Oh SHELLY!!! I’m serious….my boys are going to flip out over this. FLIP OUT!!! And, I am allllll about the Cool Whip. I actually have a tub in my fridge and I’ve been scooping out a little after dinner, mixing it with chocolate chips and pretending it’s ice cream. I’m weird. I made this for a 4th of July party. It was the perfect dessert for a hot day. I put crushed mini-Oreos and chocolate syrup on top. I made this recipe for a party on the 4th. It was better than I imagined!!! So good, and we put it in the freezer and had it again the next night frozen, just as good! Will definately be something I make ALL THE TIME! Plus, its so pretty when people see it they are drawn like moths to a flame! Thanks!!! I just have to say my family are huge Oreo fans, I think this may have just made us all giddy and child like inside. Thanks for the recipe! I think I’m going to try this out with Peanut Butter Oreos. Has anyone else done it? Will it be TOO much? Sure, great! Can’t wait to hear how it turns out!! hey just wondering what the purpose of the milk step is? Thank you for the yummy and quick to make recipe. I have an idea for a variation that you are welcome to share. 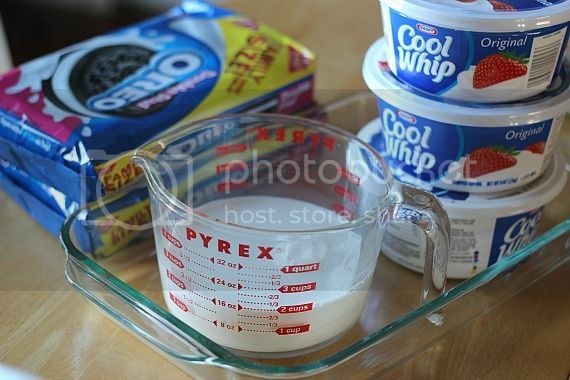 I mixed the tub of Cool Whip with Jello Oreo Pudding that i whipped up with the dry mix and two cups milk, and some room temperature cream cheese which I added a little Ghirardelli baking powder too. We call the mixture “fluff” and normally use it between the layers of pound cake and fresh fruit in a trifle . Super simple to whip up and a fun variation. Hi! Had to tell you that this was the MOST AMAZING thing I have ever had!!! And so so so quick and easy!!! I used Birthday Cake Oreos and it it was incredible!!! LOve that! So glad you liked it! Hi! can i use nestle all purpose cream for this? thanks a lot! Do I refrigerate this or freeze it? Thanks. You could do either, but I refrigerated it. hi shelly, I bought a philadelphia whipped, I’m not sure if it’s a possible alternative. I can’t find a cool whip where I am located. Any suggestion pls for a good cool whip alternative? This looks fabulous…I would add Trader Joe’s salted caramel sauce to this. The recipe looks so yummy! I just made this! It was insanly easy, and incredibly fast to make. I cannot wait for the family to try it tomorrow. I unfortunately cannot eat it due to my dairy and wheat allergy. I drizzled hot fudge over the top of mine. Looks AMAZING! ‘Cool whip’ is an imitator, full of chemicals. How can you use it?? OMG! !…looks yummy!! !…I would really love to make this for my son. Unfortunately, I can’t get Cool Whip here. Will heavy cream be as good? Oh, it’d probably be better!! I originally pinned the other pin and saw that you’d said that someone had stolen your pictures. I reported that pin and deleted it and repinned the recipe from here so that it links back to you. I can’t wait to try this – it looks absolutely delicious. I LOVE Oreos anyway…so this is definitely going to be made very soon. Thank you for sharing your recipes! This oreo icebox cake is mouth-wateringly delicious! This is a great dessert to let the kids make. Can I use an ordinary whipped cream here? Like the ones they put on starbucks frappes? I have never tried it with whipped cream, and I wouldn’t recommend the kind in the can at all. I just made one a while ago and i used Philadelphia whipped cream cheese as an alternative. Do you think it’ll taste good? My cousin recommended I might like this web site. My grandmother used to make an icebox log. She used chocolate wafer cookies, slather whipped cream on the wafer and stack them side by side till it was about 10 inches or so long. I think she’d like the Oreo version too. I’d like to try an Oreo log. Hope it can stick together but I think I’ll eat it even if it falls apart! This recipe was SUCH A HIT! So easy to follow and make, too. Only took me 25 minutes. I’d suggest using less cool whip though. 1 tub between each layer was almost too much to fit into my container! Also, I subbed the chocolate sauce for the chocolate shell 🙂 Highly highly recommend for any summer parties, etc. Delicious! I love it and deff want to try. But I have to ask, why dip them in milk? OMG! I was laughing so hard regarding your comments on “not” making beef wellington and homemade pudding…….. Sooooo true and so funny! Then I got to the recipe. How easy is that! My family is a big “Cool Whip” bunch around the holidays. Can’t wait to make it! I want to try this real soon! I’ve been really craving oreos lately. I love them dipped in milk and love whipped cream so I’m sure I’ll love this. Looks like it’ll be good. Similar to something my Mom made but it wasn’t oreo cookies it was some type of chocolate wafer with whipped cream. My boys would love helping me with it too. I just really shouldn’t eat it all myself so I need to see where I can take it to share with others. this would be amazing with some brownies in it too. uh-oh..
Eu não acredito que aqui no Brasil, não vende esse creme branco, isso é chantilly? sorvete? o que é isso? In my country we don’t have the cool whip, so what can i use instead of it? Thank you for such an imaging idea!…. I use chocolate Oreos for the first and last layer, the middle layer I used the golden Oreos … Can’t wait to see how that looks turns out ???? I’v made this for years, except we use caramel ice cream topping. It has always been a hit with my children, now with grandchildren. We love, love this, even better the longer you have it. Its my son’s birthday today & i’m just now getting ready to make this delicious treat for his birthday cake….had no idea that i’d have to let it sit in the fridge for 6 whole hours though! How will it come out if its not in there for that long? The cookies will not be as soft if it doesn’t sit, but it will still be good! yummy will be fixing this.. I made this with Mint Oreos- SO GOOD!!! Love this recipe!! How many packages of Oreos does it take to get 90?? ?